Travelers and locals in the Australian state of Queensland are caught in a real-life “Jaws” film after a MONSTER shark – perhaps measuring as long as 25 feet – was believed to have mauled another great white shark. As the picture shows, the smaller shark was bitten almost in two. The image –showing a great white bitten in half– is causing a buzz on the Web. 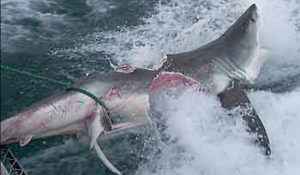 The violent shark-on-shark attack is raising fears along the Queensland coast. Authorities have warned swimmers to stay out of the waters around Stradbroke Island, a popular tourist destination for Australians, while the giant shark remains on the prowl. “It certainly opened up my eyes. I mean the shark that was caught is a substantial shark in itself,” Jeff Krause of Queensland Fisheries told the Sydney Daily Telegraph. In one swift bite the larger shark, estimated to be 5 feet longer than the fictional shark in the movie “Jaws,” apparently tore into the side of a 12-foot great white that had gotten tangled in netting near north Stradbroke Island. About 500 feet from the shore, shark nets line the popular beaches of Queensland to protect swimmers from the violent sea predators. Environmentalists have complained the nets are taking the lives of migrating whales.